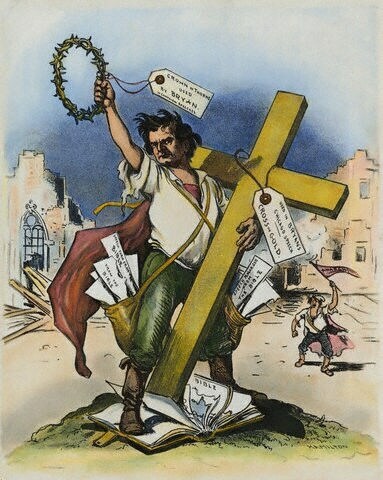 Democratic and populist leader William Jennings Bryan, climaxed his career when he gave his famous “Cross of Gold” speech which won him the nomination at the age of 36.
artist’s rendering of William Jennings Bryan delivering his “Cross of Gold” speech at the July 9th, 1896 Democratic Convention at the Chicago Coliseum. As prominent Republicans like Jeb Bush endorse Ted Cruz, they — and in turn Cruz — will have to come to terms with some of the Senator’s more “fringe” positions. Seemingly, Cruz will have to moderate or modify his stances or the Jeb Bushes will have to distance themselves. Take for example, Cruz’ declaration to “abolish the IRS.” While abolishing the IRS may fit theoretically within Cruz’ flat tax scheme, the call itself is more a slogan than a practicality. And it’s hard to see the Republican establishment wildly trumpeting the Abolish the IRS plank in its platform. That’s more from Barry Goldwater’s 1964 playbook that ended in a Johnson landslide (about which we have written). Another even more quixotic and seemingly doomed plank in Cruz’ platform is his demand for the nation to return to the Gold Standard. The gold standard had effectively ended in 1933 when the federal government halted convertibility of notes into gold and nationalized the private gold stock. Not surprisingly, critics like Paul Krugman mock Cruz’ lust for gold, believing the issue was settled correctly and for good 80 years ago. 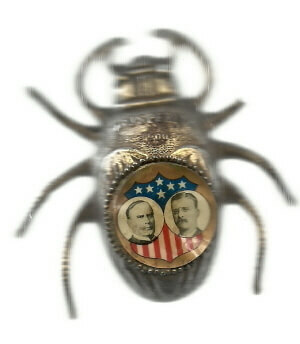 While some pundits think Cruz is smart to campaign on the gold standard, I find it hard to imagine Jeb Bush and Lindsey Graham becoming born again 19th century Gold Bugs. It is unclear how prominently the Gold Standard would figure in a Cruz’ general election campaign or whether it would become a plank in the Republican platform. 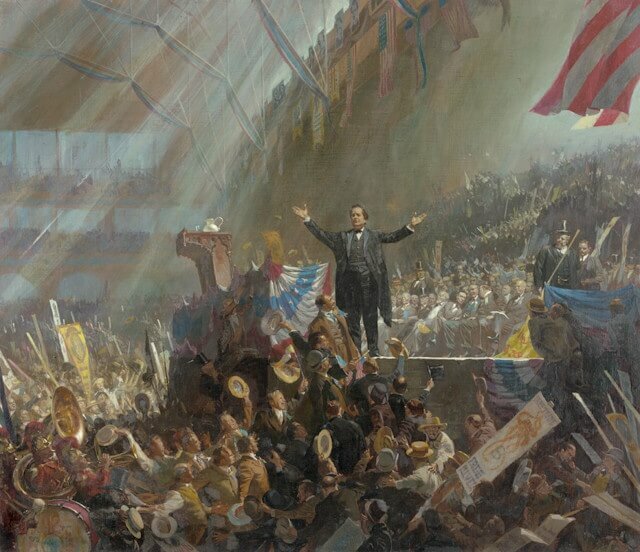 But such would be the first election since 1896 and 1900 — when William Jennings Bryan twice lost to William McKinley — that the gold standard was up for debate. To refresh myself on those elections, I turned to my perennial source, historian Richard Hofstadter (1916 – 1970) whose seminal 1964 essay “The Paranoid Style in American Politics” is, not surprisingly, once again making the rounds in 2016. As explained by Hofstadter in “William Jennings Bryan: the Democrat as Revivalist” from The American Political Tradition (1948), since the 1870’s the Gold Standard was felt by farmers in the West and South to be a crippling instrument of Wall Street designed to keep prices low by limiting the supply of “hard money.” Instead, farmers and small businessman wanted a bimetalism that included the more plentiful, and hence inflationary, silver. The result was volcanic. 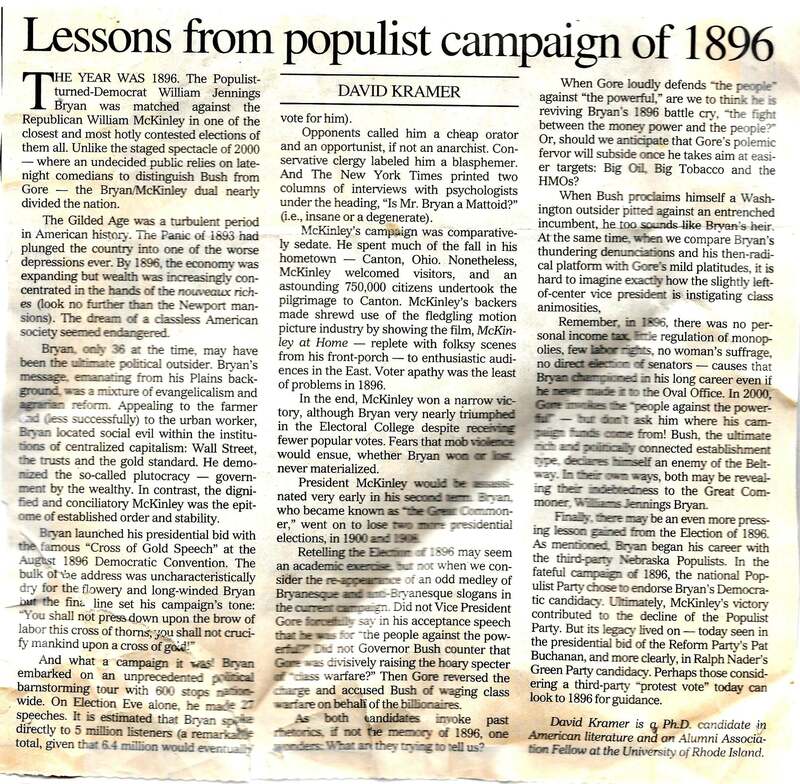 Taking the message of populism and Free Silver around the nation, speaking directly to 27 million people, the “Great Commoner” came reasonably close to defeating McKinley in the November election, a victory that would have been, as Bernie Sanders might say, a political revolution (about which we have written). 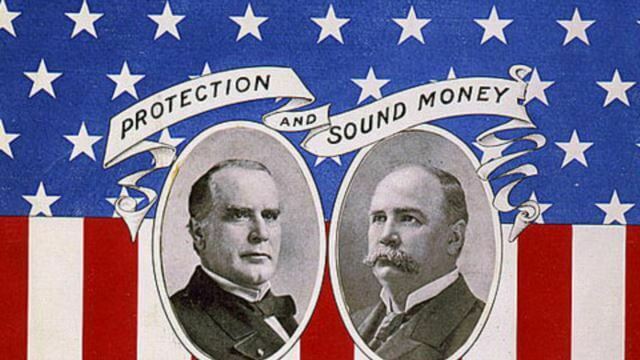 Today, Cruz is defending the opposite of Bryan, standing like McKinley is support of the gold standard. It remains to be seen if Cruz plans his own invocation at the 2016 Republican Convention: redeem mankind upon a mantle of gold. Note references to silver in the bells and the coin. The octopus represents the power of Wall Street and the Trusts. The small resisting figures against the Statue of Liberty are Cubans and Filipinos. In 1900, Bryan also ran on an anti-imperialist platform that gained little traction. 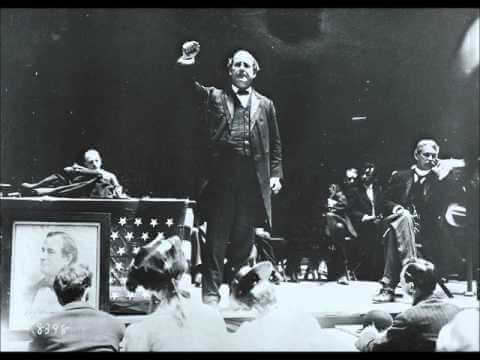 Within in the context 2016, the next election, 1900, again Bryan vs. McKinley, may be more instructive. As the 1900 campaign began, Bryan attempted to revive what Hofstader calls the “stale free silver issue” (as today a return to the gold standard may seem stale now for 80 years). Democrat leaders pushed back against free silver, believing that Bryan was unrealistic and lacked considerations of practical economics. Below is an excerpt from the excellent HarpWeek Explore History website providing details as to how Democrat Party leaders tried — but failed — to exclude the silver plank. 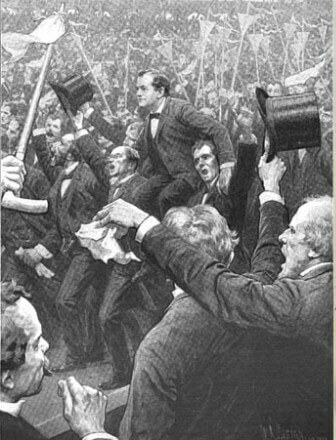 Bryan went as far to threaten running as an independent if the free-silver plank of the 1896 party platform was not incorporated unchanged into the 1900 platform. 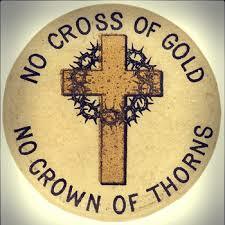 “Bryan had insisted that gold was ruining the economy and that only inflationary free silver would restore prosperity. By 1900, the economy had been thriving and growing for three years without free silver, and the Republican-dominated Congress settled the issue by passing the Gold Standard Act. In the face of all evidence and advice, Bryan refused to drop free silver. As former Republican congressman Thomas B. Reed [Republican Speaker of the House] dryly remarked, “Bryan would rather be wrong than [be] president.” Several months before the Democratic National Convention, Vice-Chairman William J. Stone of the Democratic National Committee cautioned the candidate that he had to win Illinois, Indiana, and New York to win the presidency in 1900, and could only do so by downplaying the money question. On July 1, Stone and four other Democratic leaders met the candidate at his Nebraska home to reiterate the warning. Bryan threatened to run as an independent if the free-silver plank of the 1896 party platform was not incorporated unchanged into the 1900 platform. After the meeting, he telephoned key delegates to convince them to vote for the free-silver plank. 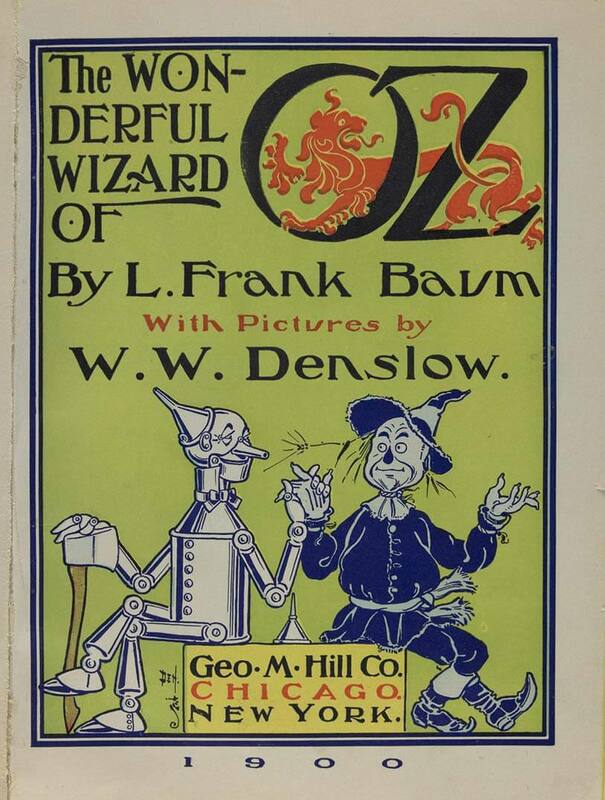 Not coincidentally, L. Frank Baum’s satire The Wizard of Oz was published in May, 1900 only two months before the Democratic Convention. While Baum’s fantasy skewers most everyone, he was a Republican who disliked Bryan who is widely seen as represented in the Cowardly Lion. 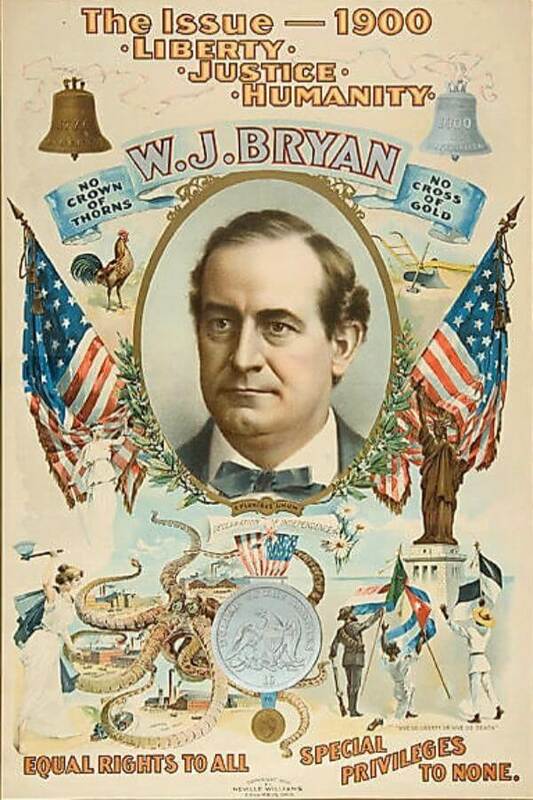 The characters in the parable are considered to be drawn from the 1896 campaign: The Wicked Witch of the East = Eastern industrialists and bankers; The Munchkins = the citizens–most of whom were oppressed; The Scarecrow = the western farmers; The Tin Woodman = the downtrodden eastern workers; The Cowardly Lion = William Jennings Bryan; The Wizard = any President from Grant to McKinley; The Yellow Brick Road = the gold standard; Dorothy’s silver shoes = the Democratic/Populist demand for silver coinage; The Emerald City = Washington, D.C. Finally, even writing about the 2016 election and the Gold Standard feels fantastical, anachronistic, arcane and surreal all at once. Surely Cruz would back off his demands to abolish the IRS and return to the gold standard, calling them symbols of what is wrong with the nation and not policy priorities. Surely Cruz would not do as Bryan did in 1900 and crucify himself by demanding a “Gold Plank” in the Republican platform. And if he did, would Clinton or Sanders rise to the defense of the strictly paper currency system? Also below is a look at the 1896 election in relation to the 2000 election. Political historians often say that 1896 and 1932 were the two most consequential modern American elections. Some argue that FDR’s victory was to some degree a vindication of Bryan’s propositions.